After kicking off the week in my favourite room, I’m moving to my second favourite one: my tiny urban cottage garden. Cottage garden is probably pushing it: it’s a tiny urban patio with raised beds, lots of pots and many examples of Reuse. Gardens are a great canvas and teacher for Reuse because nature does it so well. For example, leaves and twigs offer shelter to wildlife but when they decay, they turn to leaf mould and improve the soil structure. Similarly, the winding tendrils of climbing beans are the support and feeding system for these tasty vegetables and when all have been picked, they can be dug in or popped on the compost so the nitrogen can rot back down and feed the soil. As Reuse is an innate part of nature, it makes sense for the gardener in me to apply the same principle and the soil is the natural place to start. Although I work in pots and raised beds, I use crop rotation, composting and even beans as green manures, all traditional ways of nurturing the soil for Reuse. Composting is a great way of Reusing garden waste and food scraps, and is a subject I’ve written about many times before, like here and here. Last year we had to do a little hard landscaping as the back wall was about to topple over and the dark decked area outside the back door (i.e. my potting corner) was rotting through. As the builder knew I was a bit of a “greenie”, he offered to take down the wall carefully and Reuse as many bricks as possible. He managed to recover over 60% of them. What a saving, and by repairing the wall we also gained eight inches in growing space! We painted the “new” wall white. It partly covered the mismatch of bricks but as our garden faces North East, it also means we reflect what little light and heat we get onto the growing are. I might as well squeeze every last drop of use out of sunlight too! Reusing the decking from the potting area was more problematic. The supporting joists had rotted, as had half the planks. As the builder could not source new ones of the same depth, we needed new materials for this job but I still picked over the lifted planks as I had plans for any I could rescue. Not pretty or technically complex plans, but ones that might eke out my limited growing space. As lack of light is the main issue in my garden, I need to grow vertically and raise my growing area as much as possible. A few breezeblocks and old decking planks allow me to raise darker corners of the patio by nearly a foot. Not much maybe, but it brings a few extra square feet into production, and in a tiny urban cottage garden every foot counts. My Reuse-style growing ledges mean space for more potatoes, lettuces, herbs, bush tomatoes and a few more pots of flowers. It also allows me to wrap the growing space around our tiny seating area, which makes the patio feel more like a cottage garden than a mismatched allotment plot. I may not be able to eat that benefit but it certainly lifts my spirit! As the garden evolves and I try my hand at different vegetables and flowers, new needs emerge and rather than rush to the garden centre there is usually something I can fashion out of something that is lying around. 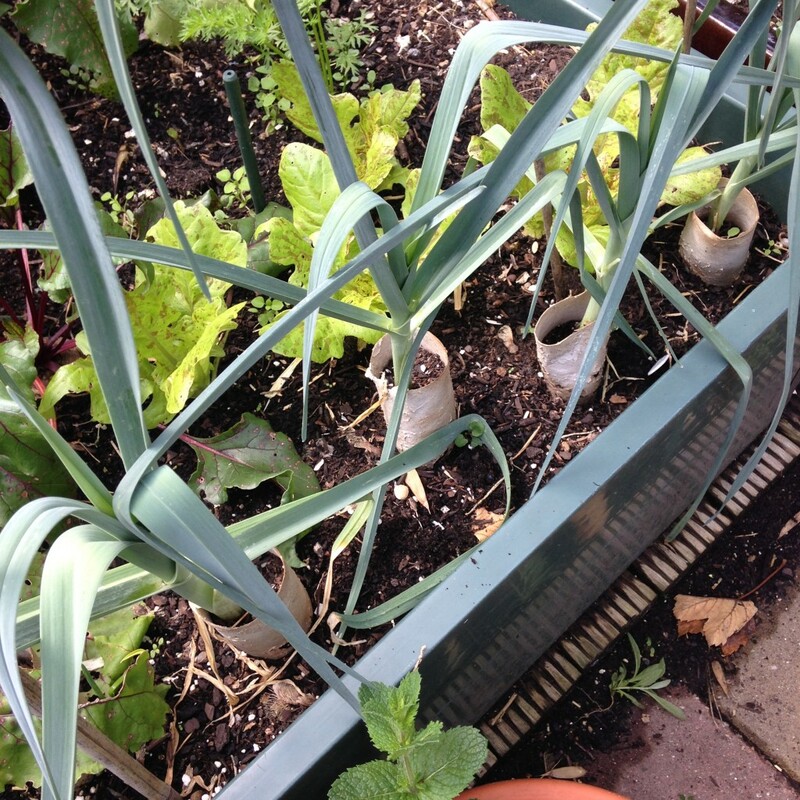 This year I am growing leeks for the first time. Some consider this is madness in a small garden but leeks are a favourite vegetable and picking homegrown food in the dark winter months boosts my mood. Leeks however need blanching to maximise the white section of the plant. This typically involves drawing up the soil around the plant as much as possible. As I didn’t have an abundance of soil, I popped toilet roll tubes over the plants and added a little earth to help them on their way. Once I’d harvested a few pots of potatoes, I used the spent soil for the more traditional approach and added the half decomposed toilet rolls holder to the compost heap. To keep the local cats off of my newly dug pots of turnip seeds, I needed a barrier. 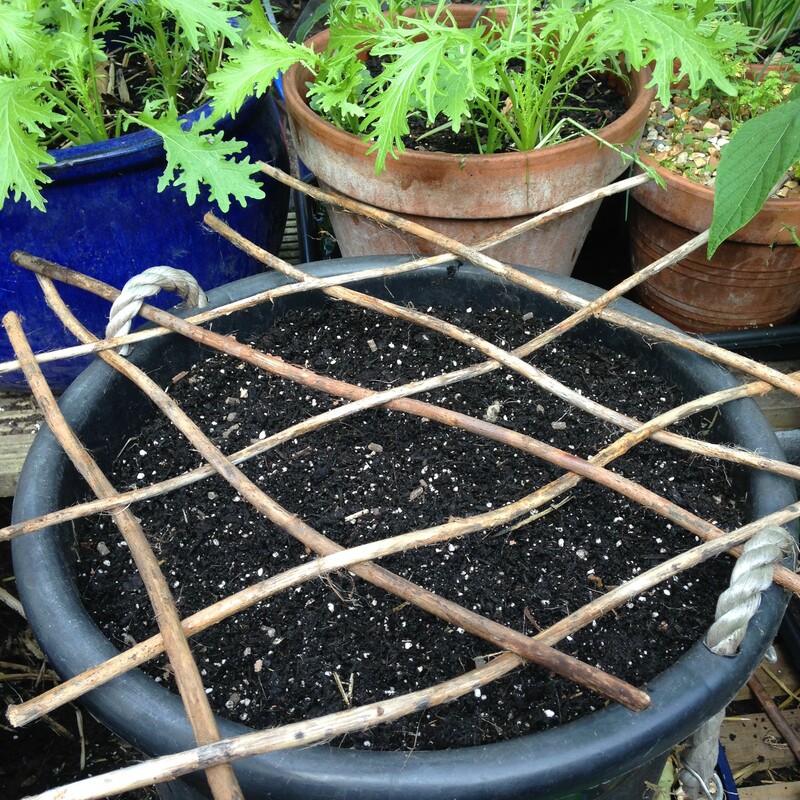 As the twigs I used on my lettuce and beetroot bed in spring had lost their spikiness, I fashioned a woven barrier out of an old beanpole. After three years of service, the pole snaps if I try to push it into the soil but cut into shorter lengths it is still flexible and strong enough to form a barrier against a cat. And then there are all the Reuse opportunities to enhance next year’s planting scheme. I save seeds, whether by shaking them directly over the soil or into old jam jars or paper bags (yes, sometimes I accept packaging for a specific purpose! ), I dividing plants and I recently started propagating new plants from cuttings. 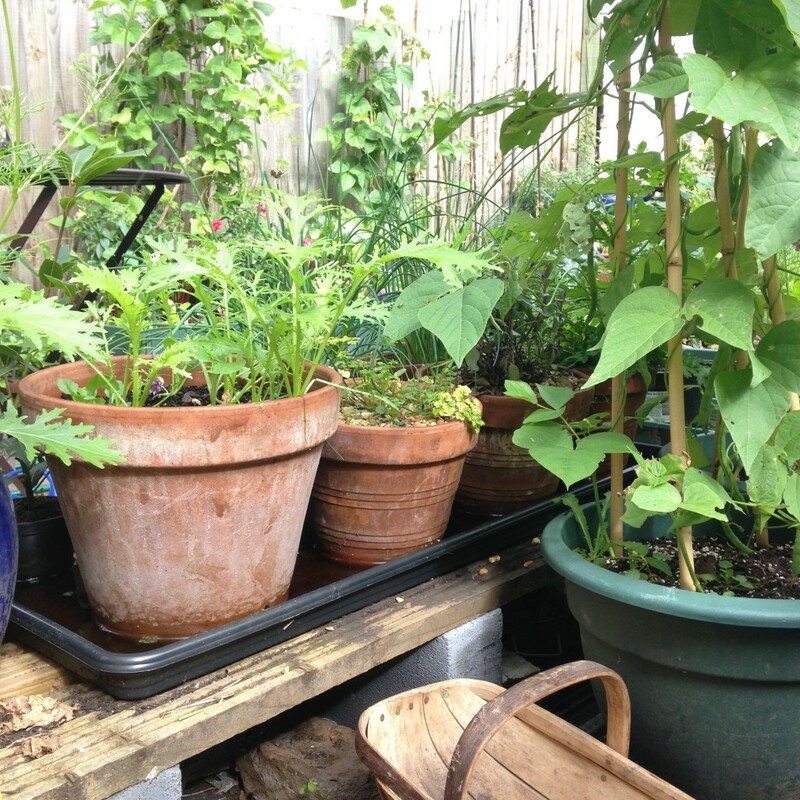 Reuse in the garden usually happens intuitively. Like many gardeners, I may head out with a mental to-do list but other tasks present themselves and rather than interrupt the flow, I just make use of what’s already there. It’s an intuitive, gentle approach to Reusing and waste avoidance but also a powerful form of environmental learning and activism, not least of all because it grows happiness. This post is inspired by Zero Waste Week and it’s theme of Reuse. To learn more sign up to the website, follow @myzerowaste or check out #zerowasteweek on Twitter or Instagram. Not convinced there is any point in taking little steps to reduce waste? Well today, Zero Waste Week was cited in the House of Commons when Kerry McCarthy MP presented a new bill to reduce food waste! Please share your horticultural Reuse suggestions in the comments below. Just a thought; have you tried tilting some of your containers towards the sun in the Spring and Autumn? This would change the angle of incidence with the sun, enabling raised soil temperature and a longer season. I really like the cat prevention measure.